Ahh, another great title… :p One of these days I’ll be back in my groove. I hope. Anyway… Here you will find a bunch of cool resources for homeschooling, such as, unit studies, free lapbooks, kindergarten packs, etc. This is the newest pack from Over the Big Moon. It’s so cute!! LOL My little guy loves their packs!! We love Lois Ehlert’s books!! Right now is a perfect time for Leaf Man!! Here are over 70 activities to go along with the books from a blog hop on The Educators’ Spin On It. Are your kids as Angry Bird crazy as mine are??? Everyone in the house, including The Hubby, has gone totally nuts over them! I tried to play it once, got aggravated and gave up…. LOL Here are a bunch of cute printables from The Activity Mom for those cuckoo for Angry Birds! OOOH! Here’s another great group of activities from The Educators’ Spin On It!! There are 98 links in this blog hop!!! Well, that name says it all. LOL Both Cs love books about dragons! Here is a great list from The Book Diaries. Here is a link for a few notebooking pages from The Crafty Classroom. And, if you scroll down a little and look to the right you will find a GINORMOUS list of crafts for just about any theme you can think of!!! 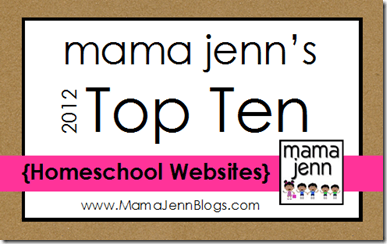 Yep, Top 10 Notebooking Sites!!!! The Notebooking Fairy (one of THE best places for notebooking) has compiled the top 10 notebooking sites! Awesome!!! I love Mama Jenn’s list. I have used every single site mentioned! They really are great!!! My kids used to all have their own mini offices… Then the big kids lost theirs….. Looks like I will be making new ones soon! This is a very good list from Rainy Day Mum. I am always looking for new and fun things to do to go along with books that we are reading. Ahhh!! Here you go! Free and Cheap Homeschooling Resources!!! Perfect!! National Geographic Videos! ALL my kids love to watch NatGeo!!!! Donna Young’s Homeschooling Resources has everything! Need a transcript guide? She has it. Need a calendar? Or a planner? Yep, she has those, too! Gamequarium has a lot of free games and videos to go with a ton of different themes. LOTS of fun! They even have some Schoolhouse Rocks videos! HippoCampus is exactly what you need if you are teaching high schoolers. They have advanced math and science and a few other high school subjects. They even have online text books. Between them and Khan Academy, there is really no need to buy high school math or science curriculum. I love Dynamic 2 Moms. They have some realllllly nice lapbooks and printables. I mean realllly nice!! They go really in depth with the topics, too. This site has all sorts of printables and activities for just about anything topic you could think of. I have printed TONS from Activity Village!! !